This is the area of high ground that overlooks Laurel to its south. 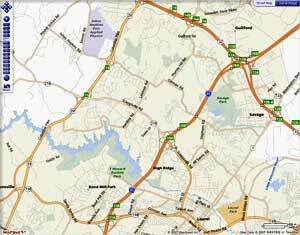 It is in Howard County, just north of the border with Prince George's County. At first glance this might seem to be about as bad a place to site a good telescope. But it would provide a good vantage point and it would be very convenient to the schools in the Laurel area. The area where we preferred to be located on the highest ground (Brewers Court, around the 9800 block of Washington Boulevard) actually already occupied by large Satellite Dishes. PROS: Convenience, convenience, conevinience. 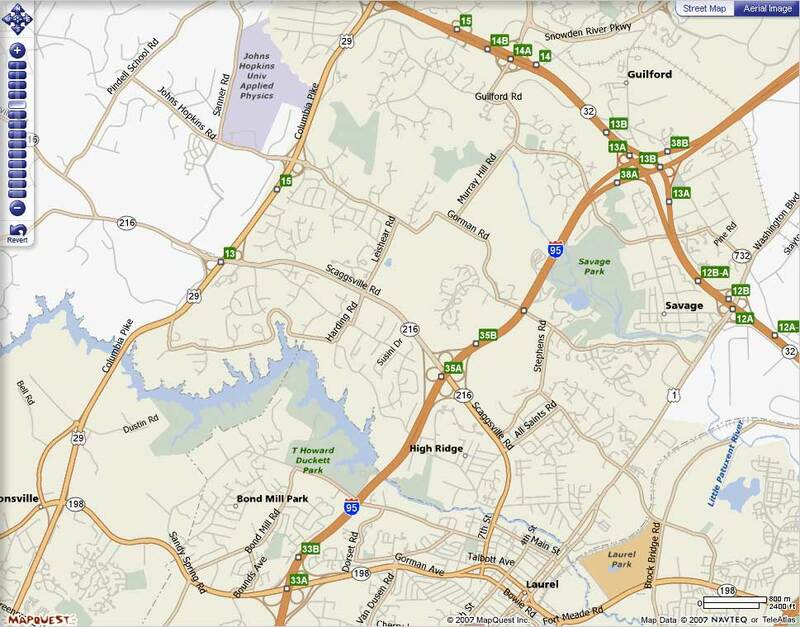 With easy access for several schools in this area from Route 1 (the old north-south artery of the East Coast and in this area named 'Washington Boulevard'), Maryland Route 32 to the north, and from east or west via Routes 216, 198 and 197. This area provides several of the highest vantage points in this part of the tri-county area. While the highest points are occupied by businesses, our facility could be located high enough that most lighting would be well below the shutter area of the Observatory Dome. Even with the sky glow from the developed surroundings the topography and atmospheric qualities of the area lend themselves well to high magnification observing with some exceptional nights throughout the year. Viewing a planet from this area can be better than most locations is dark but mountainous areas (Colorado, etc.). 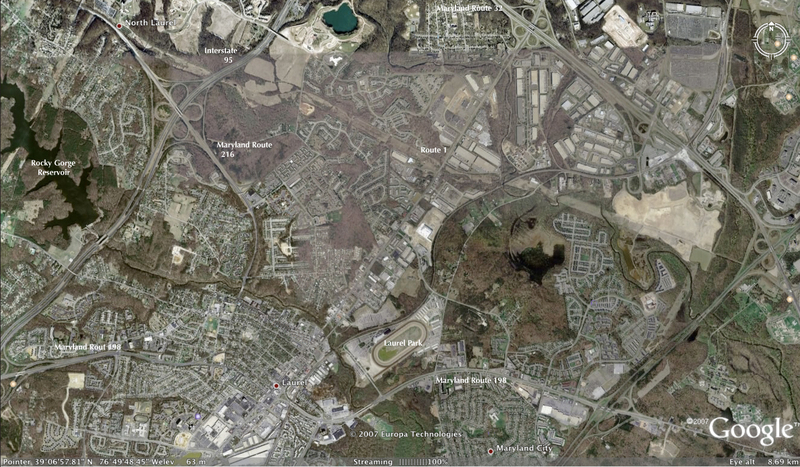 Almost due south of this area is the Laurel Park, a horse track that operates at times that are not likely to impact the Observatory. Furthermore, it is in a notably lower elevation than the Observatory. The area is probably about as fully congested and developed as it is likely to be for the foreseeable future. Being a not too congested business district, the infrastructure is very good with choices of high speed Internet access in place by Comcast Cable, and coming gradually by Verizon Fiber Optic. Howard County government has done a good if somewhat unbalanced job of providing good educational opportunities for primary and secondary school students. This area has among the older, least equipped schools, but with many students interested in the sciences. The nearby Prince George's County has several schools also that could benefit from this location including private and public schools that we have worked with in the past. CONS: At first glance this entire area does not seem like an appropriate location for an Observatory. However, we suggest doubters to look to Griffith Observatory in Los Angeles, California to see an example of how such a center can operate symbiotically in a metropolitan area. In a business district "anything goes" is possible. If we had land here a neighbor could build a tall building alongside and obscure our views. The cost of Real Estate in this area may be prohibitive. Above: Aerial view of the North Laurel area.